The best time to buy a monitor is now. ViewSonic Corp., today announces the ‘2015 New Year Special Offer’ promotion to highlight the selected 23-inches and larger monitors in Philippines. Customers who purchase the selected ViewSonic monitors during the promotion period are eligible to get a Starbucks gift card for free. ViewSonic has successfully expands its display series into the monitor sized 23-inches and larger to satisfy the demand for businesses and entertainment. This series includes products such as intuitive touch screens, edge-to-edge frameless monitors, and audio-visual entertainment models. ViewSonic SuperClear technology delivers amazing, lifelike images in which true colors are beautifully replicated on the screen. The colors you see in real life are accurately depicted on ViewSonic SuperClear monitors, ensuring high-color accuracy and consistency from screen to print. For gaming users, ViewSonic's all-new gaming monitors are designed for an enhanced user experience. With exclusive features like Aim-Point assistant for better FPS gaming accuracy, Flicker-Free Technology, Blue Light Filter and ViewSonic’s Game Mode, ViewSonic innovates to enhance gaming experience. With a complete product range, ViewSonic provides customers with a broader choice of applications, whether it is in the business sector, interactive education, digital signage, or entertainment. During the promotion period, users who purchase the selected ViewSonic 23” and above selected models, including VX2307S, VX2370Smh, TD2420, VA2446m, VG2439m, VX2452mh, and VX2456Sml, are eligible to get a PHP100 Starbucks gift card. 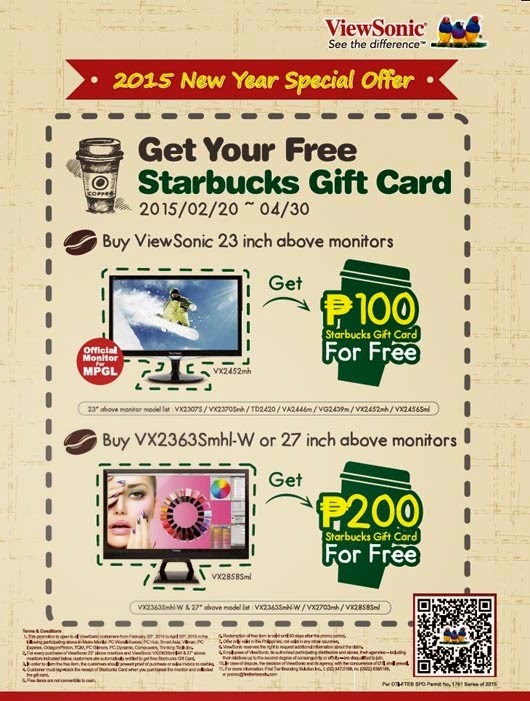 Users who purchase VX2363Smhl-W and 27” above monitors, VX2703mh, VX2770Sml and VX2858Sml, are eligible to get a PHP200 Starbucks gift card.